As the daughter of two athletic Romanian immigrants, Dominique was destined to follow in her parents’ agile footsteps. At the young age of 3, she started taking gymnastics classes in Highland Park, Illinois. While Dominique’s athletic interests appeared to most as a childhood hobby, gymnastics rapidly developed into her passion and, ultimately, embarked on the road to Olympic gold! By age 10, Dominique’s talent, abilities and hard work led her to world-renowned coach Bela Karolyi. Seven months after joining Karolyi’s gym, while still at age 10, Dominique became the youngest athlete to qualify for the U.S. Junior National Team. At the 1992 Junior National Championships, she finished fifth in the all-around and continued her ‘youngest streak’ by becoming the youngest gymnast to win a gold medal at the championships (on Balance Beam)—a record that still stands. That same year, as the youngest gymnast to ever compete at the Pan American Games, Dominique earned five medals (four gold), again becoming the youngest gymnast to capture titles on vault, bars, floor exercise, all-around and in the team competition. Although the 1993 Junior National Championships did not result in the same level of success as in 1992, Dominique considers her seventh place all-around finish to have been an important growing experience. By the 1994 Junior Nationals, Dominique triumphantly returned, capturing the coveted all-around medal in addition to two event gold medals for vault and floor exercise. Dominique had another stellar year in 1995. After winning a gold medal in the uneven bars at the Reese’s International Gymnastics Cup, she placed first in vault at the American Classic and continued her winning streak at the Visa Challenge by capturing her first all-around title against an international field and winning gold medals in the floor exercise and team competitions. At the 1995 U.S. Senior Nationals (her first major Senior national meet), Dominique became the youngest gymnast in U.S. history (at 13) to capture the all-around title before going on to win the title once again at the World Team Trials. Consequently, she was named to the 1995 World Championships team that went on to win a team bronze medal. Dominique took fifth in the all-around competition in her first World Championships appearance. She also won the silver medal in the balance beam event finals competition, earning the distinction of the only individual medalist for an American that year. During this successful run of performances, Dominique repeatedly found herself in physically and emotionally abusive situations during training. Taught not to question her coaches for fear of being released from the Olympic team, Dominique never complained, but longed for a safer system of positivity and vowed to herself that should she ever coach young athletes, her approach would be different than the atmosphere of fear and shaming that surrounded her at the Karolyi ranch. Leading up to the 1996 Summer Olympics in Atlanta, Dominique suffered a painful stress fracture in her tibia, resulting in a disappointing U.S. Nationals finish. In retrospect, it is clear to Dominique that the repetitive training tactics of the Karolyi’s led to the breaking down of her body at such a young age. Her injury had a considerable impact on her training immediately before the Olympic Games, ruining her chances for an individual gold medal. Despite the fact that Dominique’s limited-by-injury Olympic performance resulted in no individual medals, she fought through the pain and contributed significantly to the women’s team’s history-making result. In fact, her vault score in the team finals mathematically solidified the U.S. Women’s team victory. The 1996 Gymnastics team was the first American Women’s Gymnastics Team to win the Olympic team gold medal. The dynamic squad was dubbed the “Magnificent 7” by the media. Immediately after the 1996 Olympics, Dominique’s coaches Marta and Bela Karolyi abandoned her and her training, leaving her to fend for herself. She had several coaching changes for a few years until 1998, when she began training under the guidance of Luminita Miscenco, a former gymnast from the famous school in Deva, Romania. In the gymnastics community, much doubt arose about Dominique’s ability to rebound from the disappointment of not winning an individual medal in Atlanta. Many had counted Dominique out from being highly competitive again. However, through much hard work and focus, she earned her way back into the spotlight as an elite athlete, and credits Miscenco for putting her back on track and for helping her adjust to her new frame after she grew almost ten inches in height and gained nearly 20 pounds in 1997. As Dominique continued to develop physically and mentally under the guidance of Miscenco, her confidence was restored and her eagerness to prove herself as an individual international competitor escalated. Leading up to the 1998 Goodwill Games in New York, there was a great deal of pressure on Dominique. USA Gymnastics was reluctant to give her a chance to compete and represent the United States once again. Thankfully, Dominique’s father fought for her and eventually USA Gymnastics sent a national team staff member to evaluate Dominique. Embracing the challenge with determination and maturity, Dominique proved to USA Gymnastics and to the world that her will to succeed could overcome adversity. Eventually, USA Gymnastics gave the green light for Dominique to compete in the Goodwill Games. In a breathtaking performance at the 1998 Goodwill Games, Dominique triumphantly captured the all-around title. The accomplishment was a historic moment in gymnastics, with Dominique becoming the first (and only) American woman to ever win the distinction. Dominique’s gold medal re-established her position among the world’s elite. In the fall of 1998, Dominique, age 17, navigated through a challenging and emotional family struggle when she sought legal emancipation from her parents. The distractions and media circus caused conflict with her training and took a toll on her emotionally. Even with her privacy being regularly invaded and her training routinely interrupted, Dominique strove to maintain a level of poise well beyond her years. Having missed months of training and competitions, new doubts arose surrounding her ability to rebound. However, Dominique’s undying spirit and her love of the sport continued to flourish. In a determined comeback effort, Dominique moved to Cincinnati in January of 2000 to resume training under the management and support of 1996 Assistant Olympic coach Mary Lee Tracy. Advancing from the U.S. Classic through to the U.S. National Championships, Dominique was well on track to realizing her Olympic dream for the second time. Unfortunately, a sudden knee injury forced her to withdraw from the 2000 Olympic Trials. Following the 2000 Olympic season, Dominique remained active in the gymnastics community through national tours, coaching at an Ohio gym club, teaching at summer camps and traveling the country to host clinics at gyms. After a five-year competitive hiatus, Dominique surprised and delighted fans in 2005 with the announcement that she would return to elite gymnastics at age 23. Coached by her fiancé, Dr. Michael Canales, Dominique drew strength and enthusiasm from the positive, team-based approach that leveraged Canales’ experience as a physician, collegiate gymnast and confidante. Despite their efforts being ultimately derailed due to injury, Dominique and Mike credit their 2005 training sessions as a source of enrichment for their relationship. After receiving surgical treatment for an Achilles’ tendon injury, Dominique decided to resume training on only floor and vault as a specialist with the ultimate goal to compete at the 2006 Senior U.S. National Championships. After attending the national team training camp in July of 2006, and competing at the 2006 U.S. Classic to fulfill the qualification criteria outlined by the selection committee, Dominique was ultimately blocked from participation in the 2006 U.S. Championships in what proved to be a controversial decision. An appeal was made to USA Gymnastics, but the ruling was not overturned. Dominique rebounded from the disappointment of 2006 by turning her focus toward building a family and furthering her education. She exchanged wedding vows with Mike in November 2006, and welcomed their first child, daughter Carmen Noel on Christmas Day in 2007. Dominique received her bachelor’s degree in Business Administration from John Carroll University just two months after the family’s second child, Vincent Michael was born in March of 2009. In 2012, Dominique released her candid, New York Times best-selling memoir Off Balance. She refused to compromise with the book and poured her heart out onto paper, sharing publicly for the first time the challenges she had faced throughout her life, including her struggles with family and the abuses she had experienced at the Karolyi ranch. Dominique's memoir opened many eyes and peeled back the layers of a dysfunctional governing body at USA Gymnastics, which she claimed had turned a blind eye to rampant abuse and neglect of young athletes for many years. Unfortunately, despite her book’s success, Dominique was met with resistance for speaking out against USA Gymnastics and the Karolyi’s and was essentially blacklisted from the inner circles of the gymnastics community. Despite financial implications, Dominique refused to back down and continued repeatedly speaking the truth about the need for change and an improved system of checks and balances in her sport. The truth about the dangers of the existing system finally revealed itself nearly a decade later, when the USA Gymnastics team physician was arrested after allegedly sexually assaulting countless young women gymnasts. After serving as a leading voice on the subject of abuse in organized sports for many years, Dominique received an invitation to testify before the United States Senate Judiciary Committee alongside fellow gymnasts on March 28, 2017 in support of a bipartisan bill designed to provide a safer future for all athletes in youth sports. On November 14, 2017, the Senate passed the legislative bill with unanimous support and Dominique was universally hailed as successful crusader for the rights and safety of young athletes. 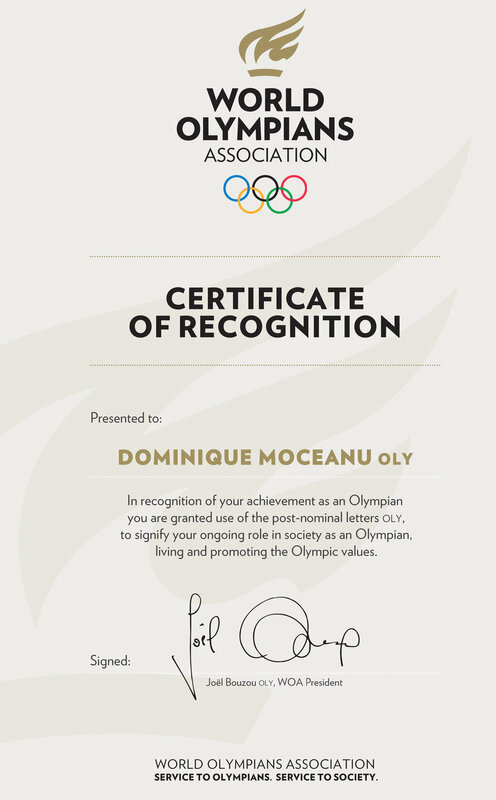 Although Dominique’s dream of a final return to the Olympic stage was not to be, Dominique has continually exhibited the heart of a champion. As a passionate supporter of gymnasts and an advocate for safety in youth sports, Dominique remains active in the gymnastics community while pursuing professional and philanthropic endeavors including personal appearances, motivational speaking engagements and entrepreneurial ventures. In 2017, Dominique started a gymnastics camp in Cleveland, Ohio to inspire a new generation of gymnasts to fulfill their potential and dreams in the sport, with safety and positivity always a priority. Website by Wish Projects and Powered by Squarespace.